What Day Of The Week Is July 11? 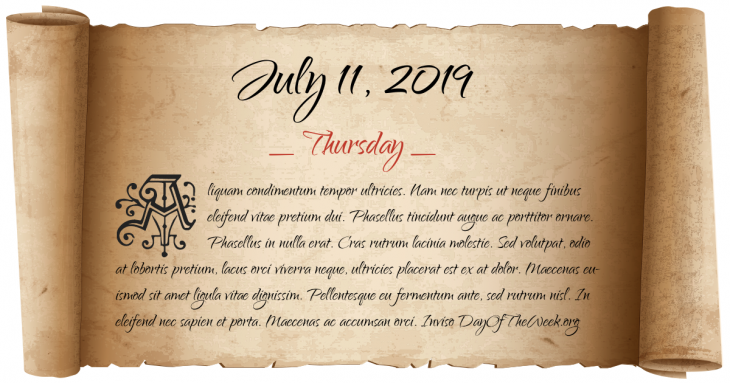 July 11, 2019 is the 192nd day of the year 2019 in the Gregorian calendar. There are 173 days remaining until the end of the year. The day of the week is Thursday. The Red Army captures Mongolia from the White Army and establishes the Mongolian People’s Republic. Prince Karim Husseini Aga Khan IV inherits the office of Imamat as the 49th Imam of Shia Imami Ismaili worldwide, after the death of Sir Sultan Mahommed Shah Aga Khan III. Independence of Benin, Burkina Faso and Niger. Who were born on July 11?